EW-36 Electric Bike Mobility Scooter is the Worlds Fastest Mobility Scooter designed for the not so old driver that does not want to feel like they are driving a "Disabled Persons Chair". 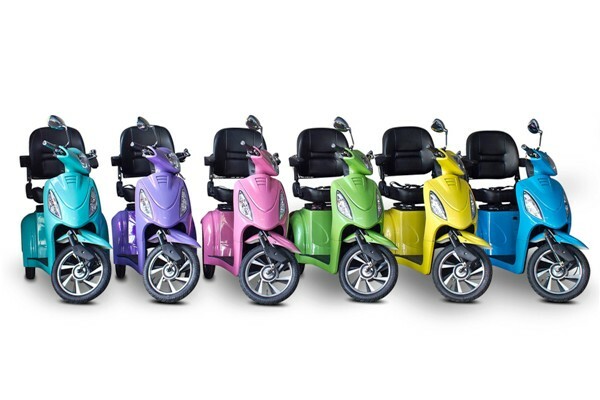 The EW-36 has 4 large batteries (20 amps each) and an All-In-1 rear end differential with motor just like the ones found in high priced mobility scooters. Item is in stock and ready to ship. Rear wheelie bars are included. This mobility moped scooter is capable of riding a wheelie in excess of 65 feet (Speed control knob is included to reduce max speed to as low as 2 MPH for drivers that do not want to travel fast.) The EW-36 is classified as a power chair or mobility scooter even though it can cruise at speeds over 15+ MPH and is legal everywhere including Canada. You don't need to be old or disabled to drive this machine around. This is the NEW EW-36 Model with all the bells and whistles. We have over 7 Years experience importing, selling and the service of this product in North America. Please except NO substitutes. WE ARE EXCITED TO OFFER YOU FOR THIS MONTH ONLY A FREE UPGRADE WITH YOUR ORDER. 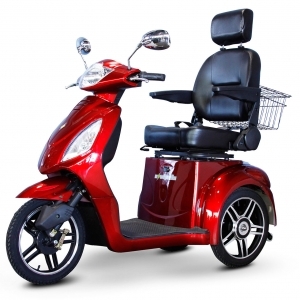 ALL ORDERS WILL HAVE THE CAPTAIN EXECUTIVE SEAT STANDARD AND IS THE ULTIMATE COMFORT CHAIR FOR THIS SCOOTER. THIS IS A $249 VALUE FREE. THE SEAT CAN BE MOVED FRONT AND BACK AND THE ARM RESTS FLIP BACK. Based on some past issues with shipping these huge crates via R & L Carriers, we have recently double crated each scooter so we can guarantee the product will be perfect and ready to go right out of the box. **Please note pictures are from 2013, the 2015 models do not have rear extended bumper and are solid in color. The EW-36 comes fully assembled and ready to ride. Before you start your journey, the batteries will need to be fully charged. The 48 V battery is made up of 4 12 V batteries. This scooter ships to your door on a pallet. If you require assistance in unpacking the scooter you should consider our White Glove Delivery Service which brings your new scooter into your home. 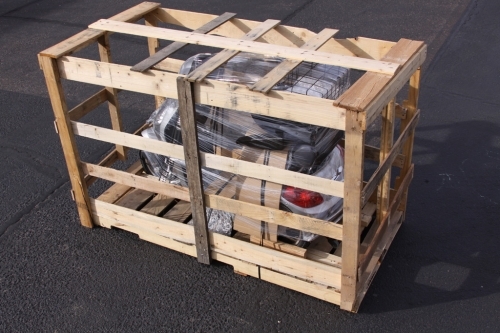 The delivery includes set-up, a quick test of its condition and performance, and the removal of all packaging material. In 2001 Congress passed Public Law 319-107 defining an Electric Bicycle / Tricycle as a 'BICYCLE' and subject to the same rules and regulations as a pedal type bicycle. An Electric bike is defined as a 2 OR 3 Wheel device, under 750 watt and may NOT have the capability of speed OVER 20 MPH, with a combination electric and human power. Each State has it's own regulations for safety and licensing, however, the same rules that apply to bicycles should apply to electric bicycles, since local or state laws may not override federal law. May be operated on sidewalks and crosswalks by any persons over 62- no license required. May be operated by mobility impaired individuals of any age. Two and Three Wheeled Scooters may be operated by anyone over 16. No license required. May be operated on streets and bike lanes with bicycle helmet. MAY be licensed (Not Required) for a one-time fee of $18, no annual renewal, Electric Bike/Moped may be transferred to another owner with the transfer of the license. Please click on all our videos to see additional information and our video test drive. If you are in the Phoenix Area, come by our showroom to test drive it in person. 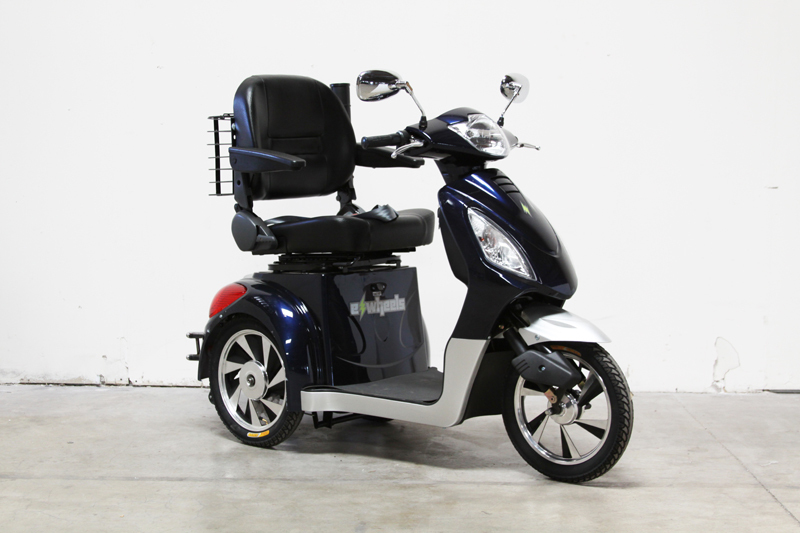 The EW-36 Electric Bike is a 3 Wheel High-Power Mobility Scooter using a 1-piece mobility Electric motor / rear axle and differential unit. At full power the EW-36 can get up to 15+ MPH, easily the fastest mobility scooter on the market! And for those faint at heart a speed control unit can be used. Also included are a reverse gear, arm rests and a stylish cargo rack. Extra storage under the seat as well. With the rising gas prices these days Electric modes of transportation are becoming an ever more affordable necessity versus traditional transportation. Note* This mobility scooter is fast. It will ride a wheelie if the speed knob is turned up to maximum. The owner / driver should be capable of driving a high powered scooter before attempting to operate this machine and to answer a frequently asked question: This machine rides like a motorcycle but the 3 wheels allow it to never tip over. "My Scooter arrived yesterday. The tracking information was as good as UPS if not better. The driver was great and the scooter arrived without a scratch. It came just like the movie you made. Riding the bike through the rest of the day showed it is very well made with all of the features you described and more. Inside the supermarket, I got all kinds of smiles and comments on how beautiful it is. Everyone looks and everyone smiles, especially me. Thanks for doing a great job, and if anyone is a little afraid to buy one, have the ask me or show them this letter. "This machine is incredible. I had it clocked at almost 20 MPH and it stops on a dime. I was going to get a Pride Celebrity and it was going to be almost $3,000. This is half the price and with Medicare not paying for my scooter--this was the perfect choice. The seat is huge and all my friends want one--my wife does not know that I did a wheelie too. I would recommend this to anyone looking for a mobility scooter." "This is ONE awesome machine. I had to let up on the throttle because I was going too fast. How it can go that fast is beyond me. It is everything I need and more." Speed: 15+ MPH Fastest Mobility Scooter on the Market! Warranty: Manufacturer's 3 Year limited warranty. Batteries (factory-installed in an EWHEELS bike) are warranted to the original owner to be free from defects in materials and workmanship for a period of three months (90 days) from the date of purchase by the original owner. The battery warranty does not include damage from power surges, use of improper charger, improper maintenance or other such misuse, or normal wear.